Now that the SNES-001 Advance’s fire is slowly burning down, it was time to start up a new project. Well this isn’t it, in fact this wasn’t even really meant to be a project in itself, but of course once I get an idea in my head, I have a nasty habit of letting it take me over. 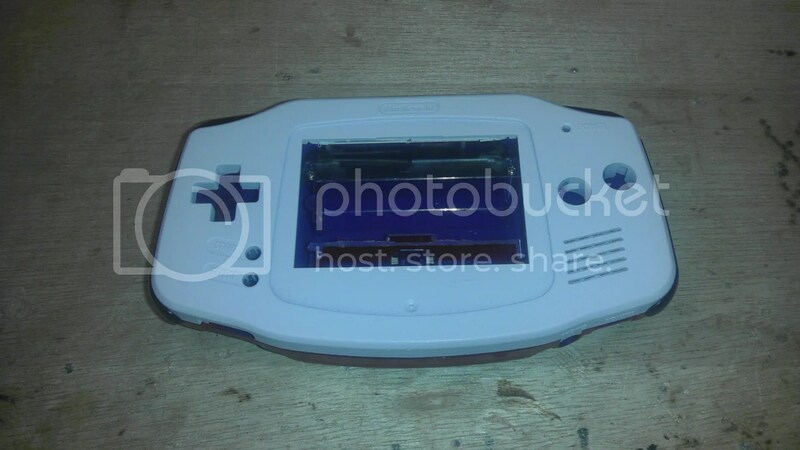 With that said, this project was supposed to just be replacing the main screens protection cover as this Game Boy Advance was a bit roughed up. Bought from a friend of mine in a bulk deal, this unit was one of the first portable gaming units I owned outside of the original 1989 DMG version of the Game Boy. As it was first released in 2000, the technology was far superior to the Game Boy on it’s own, including having more power than the SNES which came out in 1992. There was just one thing I did not care for with this unit though and that’s the fact that even after 11 years, Nintendo did not see the need to install a back light for the screen, a problem they hastily corrected with the Game Boy Advance SP. This of course led to the idea of adding a light to the screen of this unit to help with the issue. Deciding to take the system a part and find out how much room I actually had to work with in the case seemed like the next logical step after deciding that 4 – 3mm bright white LED’s could light the screen up a bit. But of course this led to another problem as these units were powered only by 2 AA batteries. The addition of 4 LED’s at 3V and 20mAh each would greatly decrease the life of the batteries, so a new battery source would be required. And when a new source is added, a new method on how to replenish that source is needed. So taking apart an old Black Berry for the Mini-USB jack was quite fun and provided that medium for getting power from the charger to the battery. So everything is now cut, spaced, painted and ready to get put into place, but I’m waiting on the right size resistors to arrive as for the 5V/3mm LED’s I did not have the correct rating on hand. Now I only hope that once all the wiring is in place, I’ll have enough room to close up the unit. It’s looking good so far, but I’ll keep you up to date and as always, check the MBB forums for more info! 1- Mini USB jack for battery recharge.